This English Language, 12.5 MB Adobe Acrobat PDF operating instructions handbook for the Panasonic DMC-G2 should prove to be a fantastic read, all 220 pages of it – be sure to download it. The user manual is titled “Panasonic DMC-G2 Digital Camera / Lens Kit Operating Instructions” (right-click and save the user guide to your hard drive). If the download link for the G2 user manual didn’t work for you, go to the Operating Instructions download section for the G2 and manually locate the download link for the file. 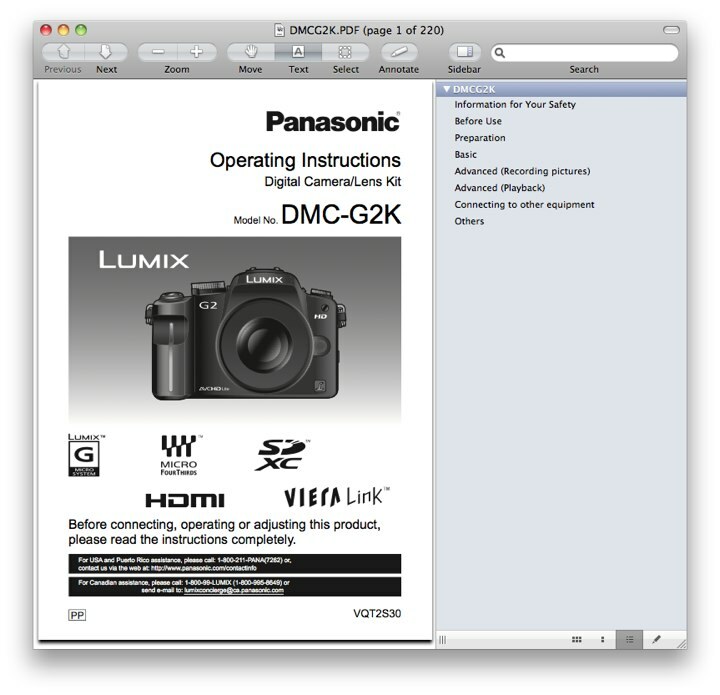 Unlike with Nikon, Panasonic allows you to freely print or copy portions from the DMC-G2 owner’s handbook without building in any password protection into the PDF. The guide discusses the features of the G2, tips and techniques on how to use the camera. It also describes the use of, and camera settings for several optional accessories. The following page references are just two examples. 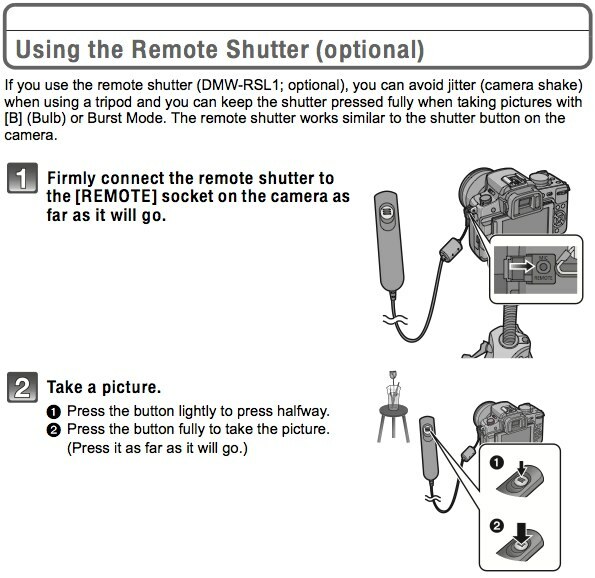 Page 179: Using the Remote Shutter (optional) — This page talks about using the Panasonic DMW-RSL1 cable shutter release remote control (see also third-party, compatible makes). 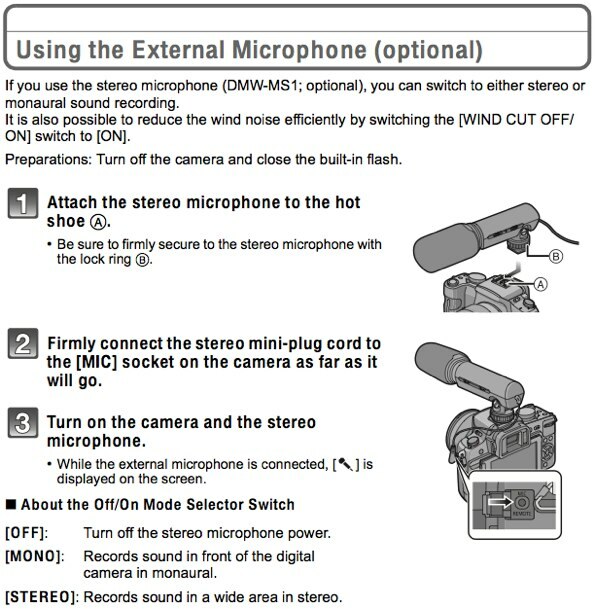 Page 180: Using the External Microphone (optional) — Record better audio for your G2 movies / footage / video clips with the Panasonic DMW-MS1 external stereo microphone mic. Visit Panasonic G2 for reviews, tips, tricks, techniques, resources and other helpful information.